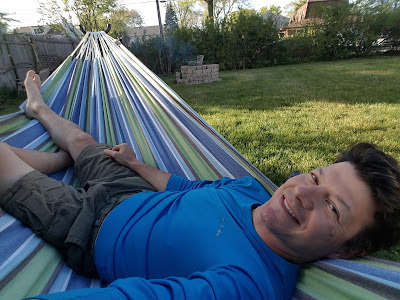 Nothing planned for this weekend but the weather also has me a bit grounded. The forecast is for drippy, cold and dreary for a few days. I saw a large population of bunker in the river this morning on my way over the Monmouth Ave bridge. That's a good sign but I didn't have the desire to get the boat out in this weather. Instead, I have some home projects to work on such as the clogged kitchen sink and cleaning up the clam cooler. I decided to get rid of the rest of my clams by releasing them back into the river. If clams could talk, maybe these would have a really great story to tell their children someday - almost like a temporary stay in a concentration camp or POW camp only to be released back into the world to tell the tale. For many weeks I kept them just barely alive in that aerated cooler changing the water every few days. While the weakest clams perished under the stressful conditions, the strong survived and were sent back home to see if they could adjust back to their normal lives. Post traumatic stress disorder would certainly be a factor in their ability to contribute in a positive way to the general population of clams in the river. Only time will tell. I had a bit of an egg mishap today that I feel compelled to share. I soft boiled one of my new eggs and as I peeled it I noticed that there was a larger than normal 'hollow spot' on the base of the egg. I just thought this to be an oddity of this particular egg but after cutting, smelling and cautiously tasting it, this egg was just not that good. I threw the rest away and then started to do some research. As it turns out, there is an egg float test that can be used to determine the viability of an egg. 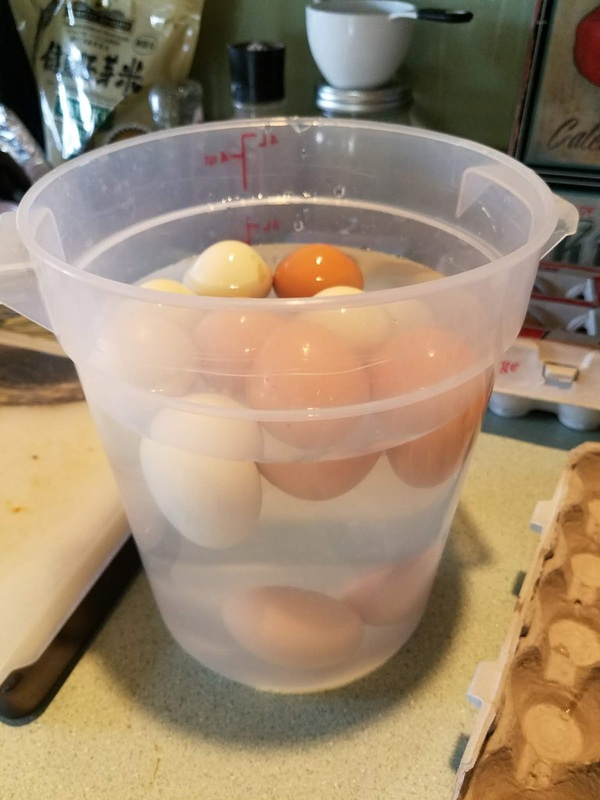 I filled a large container with water and proceeded to gently add each egg one at a time to the water to see if any sank. I was hoping for most to sink but as I continued to add eggs, all of them (with the exception of three eggs) floated to the top. My investigation showed that sinking eggs are the most fresh and full and best to eat. Sunken eggs that stand on one end had started to turn but are still perfectly edible. Floaters apparently are not good to eat. Something happens within the egg over time and as it sits out unrefrigerated it begins to give off gas from within. Using a dental analogy, when a tooth nerve dies and begins to rot it gives off gas. If the gas gets trapped with no way to escape it can begin to build up pressure - even if it is very tiny. As the pressure builds it can either find a way to escape (through a vent or fistula) or if it has no way to escape it will expand and cause swelling and pain. With an egg, I imagine that the gases slowly build and expand and cannot escape because of the sealed shell. This would explain the larger than normal void space when I soft boiled and peeled that first egg. As the inner yolk and white deteriorate, they give off gases. The same amount of matter is sealed within the shell but the previous liquid (white and yolk) are converted to gas in the decaying process. That would explain why a really really rotten egg seems perfectly normal right up until you crack the shell. This releases the noxious gas that has been accumulating with no escape vent. Refrigerating the eggs would slow this process down but not completely prevent it. Kind of like putting an ice pack on an injury or swollen area of your body. The cold slows down the metabolism and prevents the process from getting out of control too quickly. With something that's dead (like an unfertilised egg) the refrigeration could keep it fresh for much longer than without - but eventually it would decay and rot and the same thing would happen. This brings me to the "What I have learned?" portion of my Survivor Diet today. Maybe more like "What do I appreciate?" as the true Survivor Diet Challenge would not include use of a refrigerator. My rules however, clearly state that I can make use of the refrigerator - mainly for the primary function of preserving my foods as long as I can if I suddenly have a lot more than I can eat in one or two sittings. Additionally, it has made me ponder and appreciate the invention of refrigeration - just another one of those things we totally take for granted in our modern culture and society. In anthropological terms, tribes of humans decided that instead of continually migrating, they would use farming and agriculture to stay put and build their homes and cities around them. Food could be stockpiled, stored and preserved to last much longer. Still some would eventually rot and decay and thus refrigeration was created to solve this problem. Food could be preserved for greater periods of time and people could stay dormant for even longer and longer in the same spot.